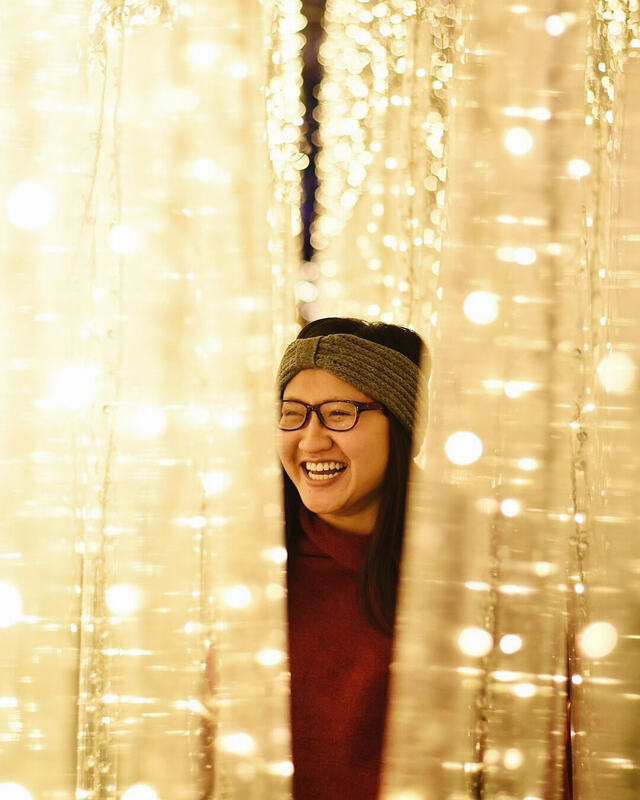 It’s glowing to be a very exciting holiday season now that Glow, Edmonton (and area)’s biggest and probably most Instagrammable indoor Christmas festival, is open! 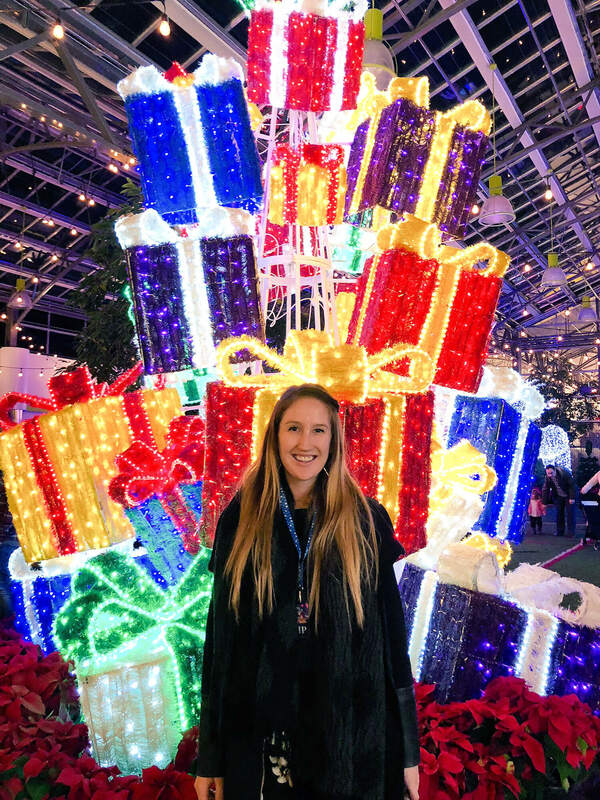 Running Nov. 22, 2018 through Jan. 19, 2019, and located at The Enjoy Centre in St. Albert, Glow features 65,000 square feet of… well—Christmas! Glow is a huge indoor, interactive Christmas light experience! 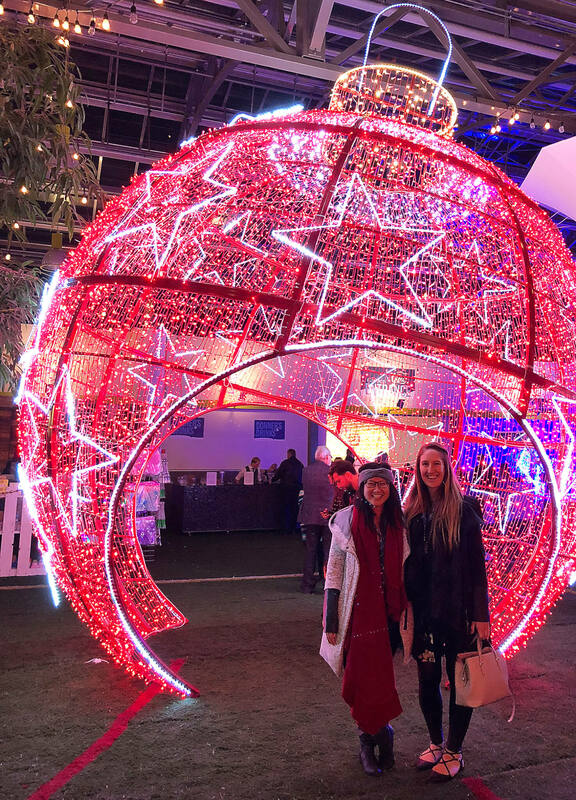 At Glow, you can stroll through a musical light tunnel, make your way through the lit-up ‘ice caverns,’ listen to live music, visit Santa, shop the local market, and much more! I was invited to opening night and was thrilled with all the photo opportunities throughout the space. 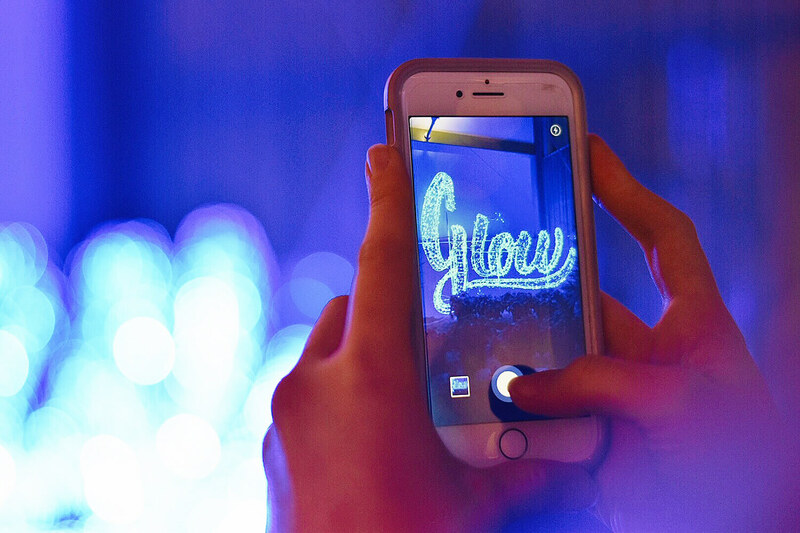 If you want an awesome, festive photo, you’ll get one at Glow. It’s also nice because they stagger amount of people that are in the space at any given time, so you’ll never feel too crowded (and there shouldn’t be too many people blocking your photo lol). If you just want to spend some festive time with your friends or family, this is a great event for that too, with lots of areas for kids to enjoy! 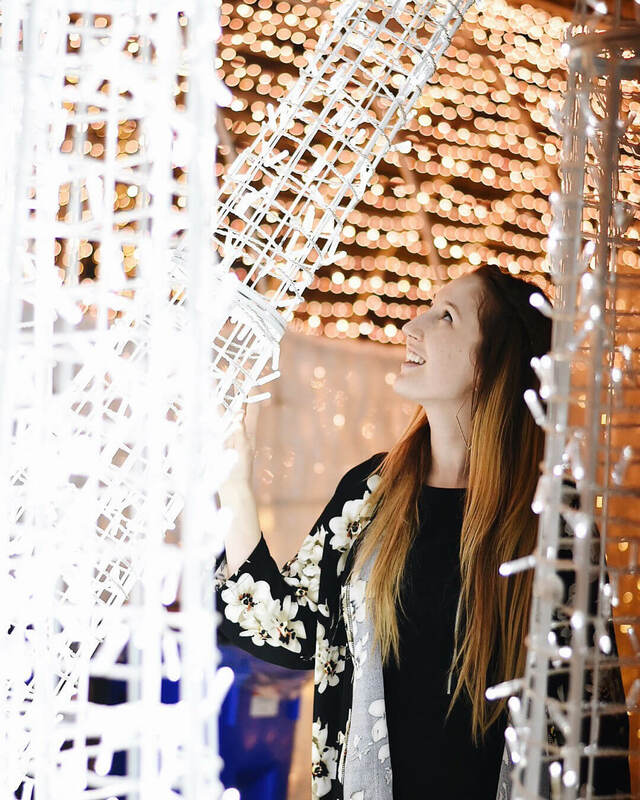 I think Glow is definitely way more fun if you take advantage of all the Instagrammable spots though, which is why I’ve put together a few must-stop photo spots for when you visit. 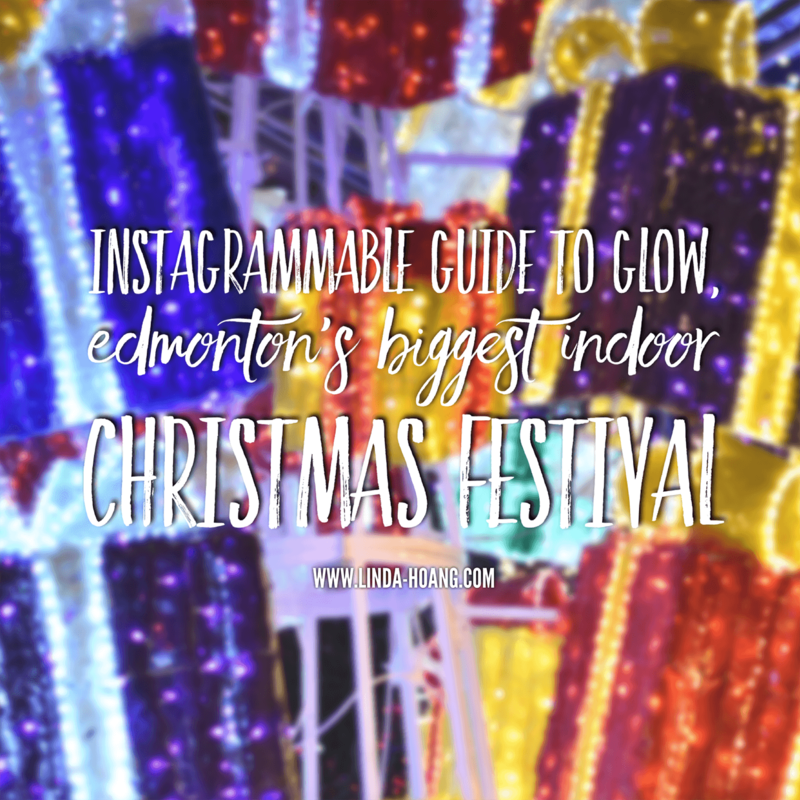 Pin + share my Instagrammable Guide to Glow Edmonton! 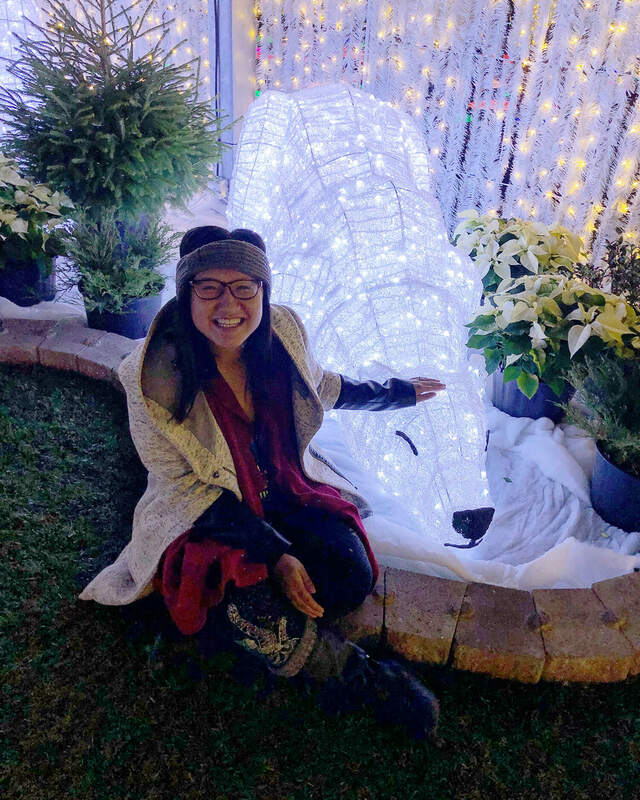 My favourite Instagrammable spot at Glow—the ice caverns! These long, hanging lights change colours and make what I think is the best photo in all of Glow! The nice part about these ice cavern lights is there are so many of them, and they’re positioned so close to one another, that even if there are people around you, you can’t really see them! That makes it also one of the easiest spots to get a clean shot with no one in the background. For an interesting perspective, lie on the floor and look up! This musical light tunnel is so pretty! This tunnel is awesome! The thousands of twinkling lights change colours based on the soundtrack that’s playing. You won’t be able to stroll under the tunnel without stopping for a photo. The tricky party is ensuring you can get a shot without people behind you. We found stopping mid-way through for a photo was the easiest to try and crowd control (lol). At Glow, there are LED lit swings and hopscotch! They’re meant for kids but aren’t we all kids at heart? No matter how old are you, I encourage you to take a swing and a jump on these colourful, interactive features! Need the perfect photo for your Christmas card? 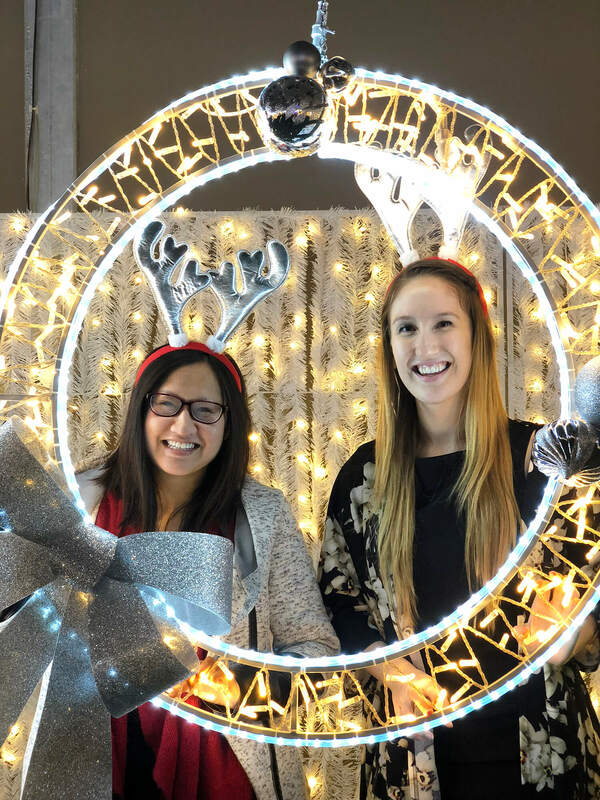 Glow’s got a few great options—giant, sparkling photo frames of all shapes and sizes for you to pop into for a photo. The biggest ornament I ever did see. The best present of the holiday season is spending time with your loved ones! Turns out colourful, glowing presents make for a great Instagrammable back drop! The tallest pile of presents is located right by the biggest ornament, so you won’t be able to miss it after you walk in. My friend Mr. Polar Bear! Throughout Glow, you’ll find sparkling animals like polar bears and penguins. They’re so cute. The polar bears were my favourite, while my friend Vanessa was partial to the penguins. Life tip: find a friend who isn’t afraid to openly waddle like a penguin in public, lol. Silver trees with the musical light tunnel behind! 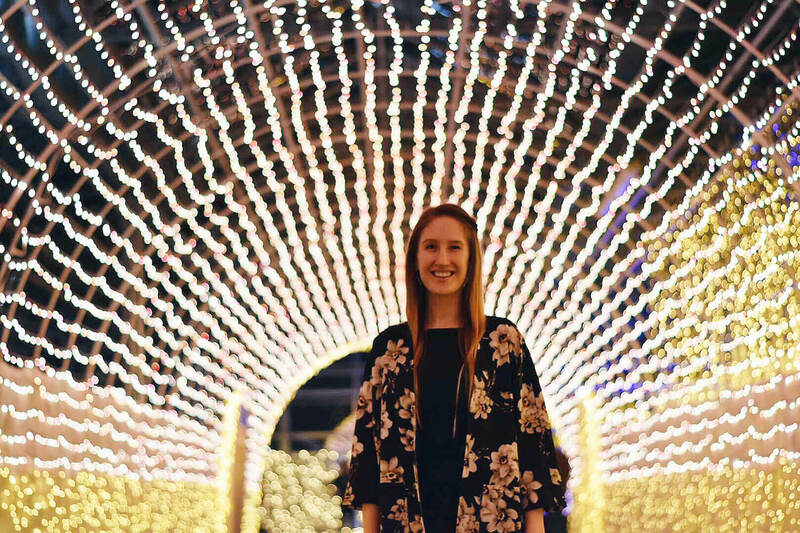 There’s a super cute, winding path of glowing silver trees which, from certain angles, can give you some really pretty blurry, bokeh shots that can really highlight that Christmas wonder in your eyes. A photo of a photo of the Glow Gardens sign. If you didn’t take a photo of or with the sign, were you really there? ;) Plus, they made it really cute. The Glow sign is begging to have its photo taken. A glittering horse drawn carriage. 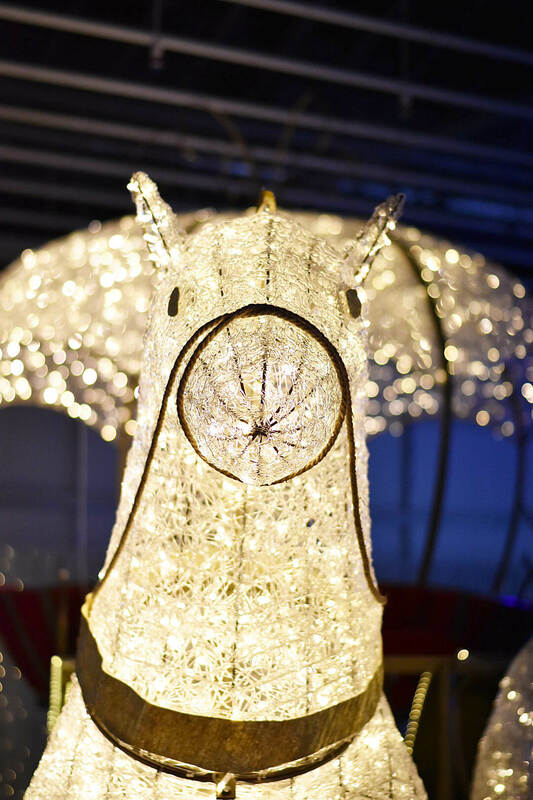 Be sure to hop into this Cinderella-worthy carriage drawn by two life-sized horses made up of twinkling lights. Bonus: there is ample, free parking! I can’t wait to come back to Glow with my family! Glow is located in The Enjoy Centre at 101 Riel Drive, St. Albert. Hours are 4-10 p.m. weekdays, 3-10 p.m. weekends, from Nov. 22, 2018 – Jan 19, 2019. Thanks to Glow Edmonton to inviting me to experience their opening night!